Glenwood Springs has lots to do in the summer, from hiking and biking to fishing and kayaking. But don’t think that the fun stops just because the weather gets cold. If you’re in the Glenwood Springs area this holiday season, here are some ideas to keep you busy. There’s nothing like lounging in naturally-heated water in the cold of winter, watching the snow fall through the rising steam. 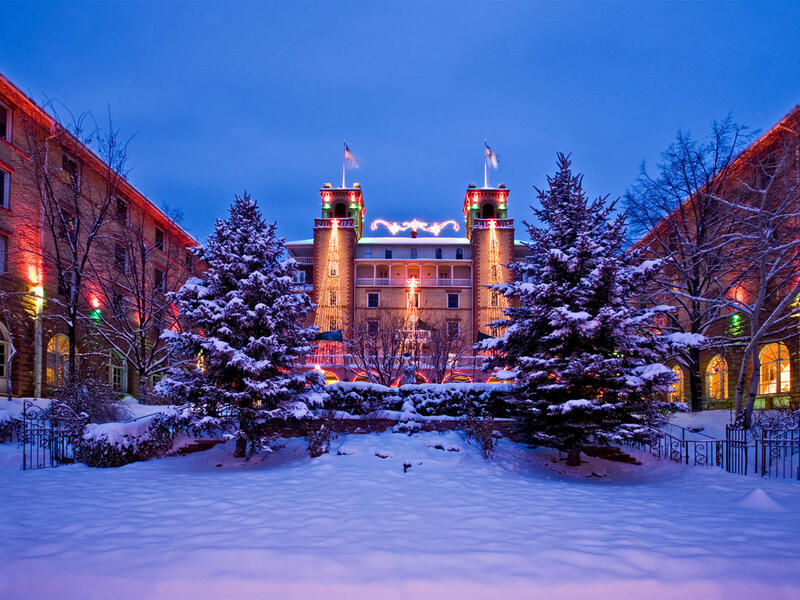 Lucky for you, Glenwood Springs has three different hot springs experiences to choose from. The crown jewel of Glenwood’s hot springs experience is the Glenwood Hot Springs Pool — 30,000 square feet of naturally heated pool ranging from a balmy 90 degrees to a steamy 104. Whether you want to luxuriate in the hot pool and let your worries evaporate with the steam, or have some fun in the big pool, complete with lap lanes and diving boards, Glenwood Hot Springs Pool has something for the whole family. If you had something more therapeutic in mind, the Yampah caves right next door will open your pores and quiet your mind. 120-degree water runs through the limestone floor of these natural vapor caves, infusing the air with 110-degree, mineral-rich steam. For hundreds of years, locals have been using these caves to sweat their cares away — now you can join them. For a slightly more intimate setting, check out the new kid on the block — Iron Mountain Hot Springs. Opened in 2015, Iron Mountain boasts 16 individual pools ranging in temperature from 98 to 108 degrees, so you can choose the experience that’s right for you. Iron Mountain also has food, snacks, and refreshments on offer right next to the pool, so you can spend a luxurious afternoon there. Just east of Glenwood Springs along the highway is the famous Hanging Lake trail. It can be slippery in the winter, so bring spikes for your shoes, but it’s worth the hike. The trail is short but steep, but the lake itself is spectacular — in the coldest months, Bridal Veil Falls freezes into a curtain of ice that will take your breath away. If you’d like something a little more accessible, try Red Mountain. The road switchbacks up about 1600 feet above town and is an easy hike even with snow on the ground. If you hike it at night, the Red Mountain Cross at the top will be lit up, and you’ll be able to see the whole town of Glenwood Springs glittering beneath you. Looking for twinkling lights to get you in the holiday spirit? Look no further than Grand Avenue, the main street through downtown Glenwood Springs. Trees and storefronts are brightly lit at night, and numerous coffee shops, gift shops, and art galleries give you a place to duck in from the cold. For something a little more spectacular, stop by Hotel Colorado! The lights are lit in an annual ceremony just after Thanksgiving, complete with singers, dancers, and an appearance from everyone’s favorite jolly old St. Nick, but even if you miss the ceremony, you should still stop by! The lights will stay up all through the holiday season, illuminating the grounds of the hotel in hundreds of bright colors. If you come inside, you’ll find festive decorations all over the halls and lobby, as well as a steaming cup of cocoa waiting for you at the Legends cafe. Glenwood Springs is filled with restaurants, coffee shops, brewpubs, and diners to satisfy any craving you might have. Whether you’re looking for a quick drink, a casual afternoon lunch, or an intimate dinner for two, you’ll find something within walking distance of downtown that will fill your belly and warm your heart.